Richie Partridge's role is to provide rehabilitation, manual therapy, injury prevention and medical pitchside assistance during training and on match days. Richie spent eight years as a player at Liverpool during his late teens and early 20s. He qualified as a physio in 2009 and attained an MSc in football rehabilitation in 2011. He retired from professional football that same year. As well as playing for the Reds, Richie has enjoyed spells at Coventry, Sheffield Wednesday, Bristol rovers, Rotherham, Chester City, MK Dons, Stockport and Welsh side TNS. At international level, he has represented Republic of Ireland U15s, U16s, U18s, U21s and was on the bench for the senior team. 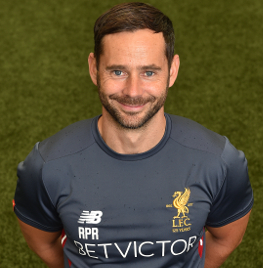 In the summer of 2016, he moved from the club's Academy set-up to Melwood to work with the first team.